Midwives, parents and researchers from City, University of London celebrated the 10th birthday of the Barkantine Birth Centre in early May. As the first purpose built, urban freestanding midwifery unit (FMU), the event was organised to coincide with the International Day of the Midwife and linked to the publication of a new report about the centre from researchers at City. 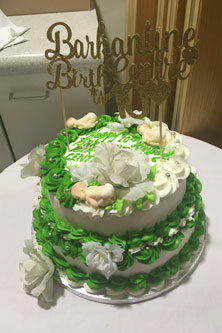 Founded with the idea of offering a social model of midwifery in which midwives could provide women-centred care, the community party marked all the hard work and achievements which have helped the centre become a reality, and keep it going as a fantastic resource for local women and as one of only two midwife-led birth centres in central London. Taking place in the Barkantine Surgery, the event involved Baroness Cumberlege, author of the Better Births report and longstanding champion of the Barkantine Birth Centre, as the guest of honour. Analysing ten years of data, the new City report highlights how the Barkantine Birth Centre functions as a community hub, offering women-centred care from the beginning of pregnancy and throughout the maternity journey. The report also shows how FMUs can offer a range of maternity primary care including all the services required by women during pregnancy, childbirth and postnatally. The centre itself has a capacity of up to 500 birth a year, and has five birthing rooms with a pool, but also supports community and homebirths. In the last 10 years, 8,341 women have booked at the Barkantine, with 3,804 women (46 per cent of those booked) giving birth at the centre, with the friendly and relaxing environment one of the primary reasons why women and their families plan to give birth there. Over the last 10 years, a majority of women who gave birth at the Barkantine did so either in the pool or on a mat, with 42 per cent of those who gave birth opting for water birth. The majority of babies (97 per cent) born at the centre in the last 10 years have been healthy and did not require any resuscitation, and only 3 per cent of the babies born at the centre have needing basic newborn life support. The integration of a GP surgery within the centre also means that Barkantine staff can serve the Tower Hamlets community in a variety of ways. The researchers at City also found that giving birth there was more cost effective, as the average cost for a mother and baby’s care was £1,296.23, which is approximately £850 per patient less than the cost for the same care at the Royal London Hospital, even though women at the Barkantine had longer postnatal stays. Other research also supports the ethos behind the Centre, as in 2011, the publication of the Birthplace Research Programme - which involved Professors Christine McCourt and Alison Macfarlane from City - offered strong evidence in support of midwifery units, finding that for women with medically uncomplicated pregnancies, giving birth in a FMU, like the Barkantine Birth Centre, exposed women to a lower risk of interventions and more straightforward births. It also found that planned birth in midwifery units was the most cost effective because these births resulted in fewer obstetric interventions, which are costly to the NHS, without any increase in adverse outcomes for babies. Since then the latest national policy, Better Births reemphasised the importance of choice of birth options, stressing the value of the personalised care and advocated for continuity of midwifery care. It recommended the development of Community Hubs, such as the Barkantine Birth Centre, where a number of community health services can be co-located, including the potential for midwifery services and a FMU. “We hope that the philosophy of care, strong ethos to personalised care and calm environment championed by the Barkantine and other freestanding midwifery units can become part of the mainstream care for healthy women with uncomplicated pregnancies, both nationally and internationally.